Just a few minutes before 10:00am, a gunman wrestled with a constable at the entrance of the Canadian Parliament building, ultimately forcing his way into the building and getting into a shootout with the building's security personnel. Downtown Ottawa was placed on lockdown to protect the public, but Canada's finest went looking for additional threats, potentially at their own peril. While that incident was well publicized, Canadian policemen and policewomen risk their lives every day so that other Canadians can be safe. This Silver National Heroes Police Proof pays tribute to those who put themselves at risk for the protection of others on a regular basis. 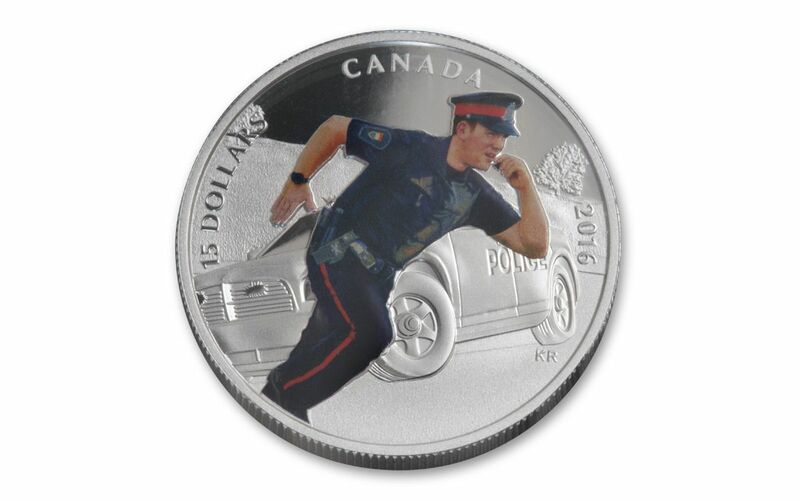 THIRD COIN IN THE "NATIONAL HEROES" SERIES – This Silver Police Proof is the third coin in a Royal Canadian Mint (RCM) series that honors Canadians who serve their communities every day. Among the other coins in the series are ones that honor paramedics and firemen. 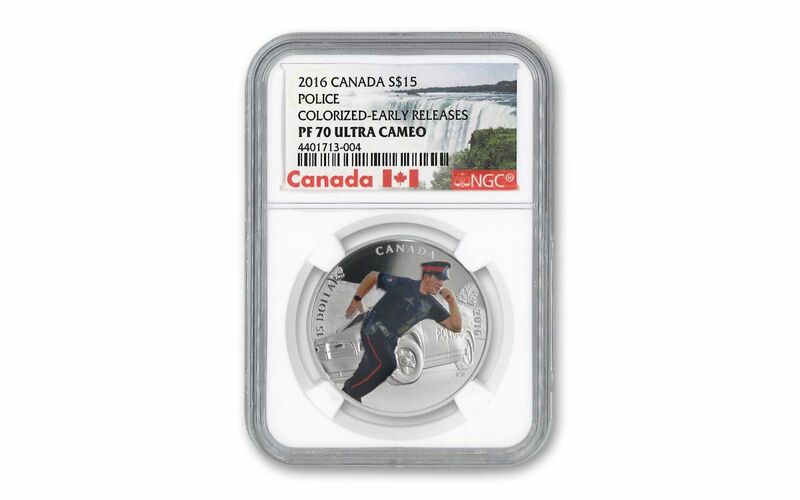 GORGEOUS PROOF FINISH – Struck from 99.99% fine silver, this coin has a stunning proof finish that does an especially good job of making the reverse background shine against the selective coloring of the policeman. 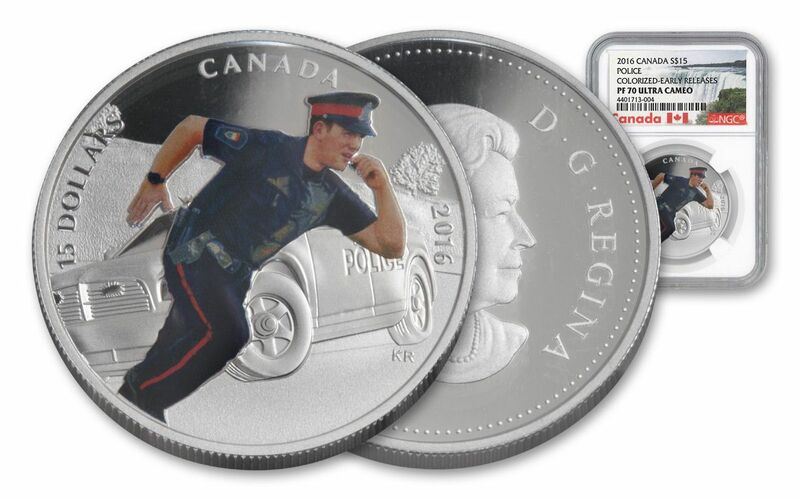 CANADA LEGAL TENDER -- Each 2016 Silver Police Proof is $15 Canadian legal tender, as noted on the left side of the reverse. CERTIFIED FLAWLESS -- You coin will arrive to you in a vinyl flip with an official certificate of authenticity and a full-color story card. Your coin will be certified Proof-70 Ultra Cameo (PF70UC) by Numismatic Guaranty Corporation (NGC), a distinction that means your perfectly-graded proof will have ZERO imperfections -- showing all features and fields exactly as the engraver and mint intended! A LIMITED MINTAGE – While policemen are among the most respected public servants, just 10,000 pieces were included in this mintage that honors them. One of the first things that most parents teach their young children is "If you get lost, find a policeman." Most people consider policemen among the most trustworthy and helpful public servants. Even as adults, the first things most poeple do when there is a life or death situation is call the police. It is fitting, then, that the Royal Canadian Mint saw fit to include the proof dedicated to these public servants in their National Heroes collection. Order yours while we still have them available here at GovMint.com.